The tactic of boldly landing in enemy territory without ground reconnaissance often proved deadly in Vietnam, where basic infantry weapons downed thousands of helicopters. Modern armies now have shoulder-fired anti-aircraft missiles and guided anti-tank weaponry that can blast helicopters as they land. Landings will prove disastrous if aerial reconnaissance fails to detect anti-aircraft systems. As a result, ground reconnaissance must conducted prior to almost all helicopter assaults. Exceptions can be made for the open desert or extreme situations, but it has become far too risky to send dozens of helicopters packed with hundreds of troops into a "hot LZ." A four-man recon team should be inserted several miles away and move silently to scout potential LZs for land mines, small obstacles, and enemy forces. If light enemy forces are located, the team can coordinate air or artillery fires on them as the landing progresses, or spring small ambushes. They wouldn't do this in advance because it would attract the attention of larger forces nearby. The team should also clear obstructions in the landing zone and guide the inbound helicopters. These tasks shouldn't be difficult in an area that aerial reconnaissance has okayed for a major heliborne landing. If the area is too hot for a ground recon teams to scout, it's too hot for an LZ. In most cases, officers should allow recon teams to select the best LZ. Too many officers have become excited about night operations because modern night vision equipment works so well. However, night operations are more difficult and dangerous, which the US military often proves with nighttime helicopter collisions during small peacetime training operations. The idea of sending dozens of helicopters into an unknown LZ at night is foolish. The US Marine Corps attempted a well planned night helicopter landing during the 1991 Persian Gulf war called "Task Force X-ray." However, the confusion of war compounded by night led to several near mid-air collisions, so the landing was scrubbed and the helicopters sent back fully loaded. It is easy to locate and target helicopters in the night sky. The noise tells gunners where to look and the dark outline of helicopters stand out, even on a moonless night. The fear caused by bright tracers, flares and explosions is amplified at night, and even the most modern night vision goggles do not allow pilots to see small obstructions in the LZ. As infantrymen charge out of helicopters during DAYTIME landings, confusion reigns for a couple minutes as leaders attempt to orient themselves and link up with troops from other helicopters. This is difficult because some helicopters may have turned back for mechanical reasons, some may be shot down, and few land exactly where they should. The wind, dust, and noise that helicopters generate causes further confusion, not to mention enemy fire. The biggest danger are mid-air collisions as helicopters land and take-off in confined areas. If just one helicopter goes down in an LZ panic may ensue. Helicopter assaults are complex and dangerous, so it is foolish to double the risk by landing at night. Darkness does not protect helicopters from ground fire, especially radar-guided or infrared guided systems. Troops running around in open fields are afforded little protection at night. Attack helicopters can provide excellent suppressive fires, but once troops hit the ground at night it becomes difficult distinguish friend from foe from the air. Nighttime helicopter landings are far more dangerous and only help the defenders. They may be surprised, but only long enough to grab their weapons and open fire. There may be cases where nighttime landings are warranted, but only when a recon team has determined that no enemy forces are nearby, the LZ is clear of obstructions, and the team personally guides incoming helicopters with signal lights as they land in small groups. Single helicopter landings at night to drop off or pick up recon teams or to evacuate wounded are reasonable. However, grandiose concepts of charging blindly into an LZ at night with dozens of helicopters is insane. Several failed night attacks during World War II prompted combat veteran Paul Fussell to write: "there seems something in the American character that makes it easy to believe that night operations can succeed ... to the general astonishment of the planners." Since helicopter assaults are complex, armies develop routines that often announce their intentions. Large numbers of low-flying helicopters make a lot of noise, but it is difficult to determine what they are doing from a distance. However, unnecessary air and artillery strikes at possible enemy positions alert nearby enemy units that a landing is in progress, and the rising smoke provides a target mark for enemy artillerymen to determine the location of the LZ. Escorting attack helicopters also give advance notice if they arrive several minutes before and circle in a neat racetrack pattern over the LZ hoping to draw fire. While these are effective tactics, they deny the landing force an element of surprise. If a recon team has checked the area, such tactics are unneeded. There is not a best tactic for helicopter assaults, but planners need to avoid helping their opponent target mortar and artillery fires on an LZ. A useful tactic is for helicopters to conduct a "touch and go" diversionary landing at other LZs after unloading their troops, possibly "supported' by artillery fires and circling helicopters. This seems like an obvious rule of war, but it is often violated in peacetime exercises. During the Vietnam war, the US military suffered thousands of casualties as helicopter landed infantrymen were pinned down by machine gun and rifle fire. The US military has fielded large helicopters capable of carrying small armored vehicles internally, but has never purchased any. The Marine Corps and Special Operations Command have retained a few old-style "jeeps" to provide instant transport, but they have no armor. The German military recognized this need several years ago and developed the armored "Wiesel" (right) that carries a machine gun and TOW anti-tank system or 120mm mortar. 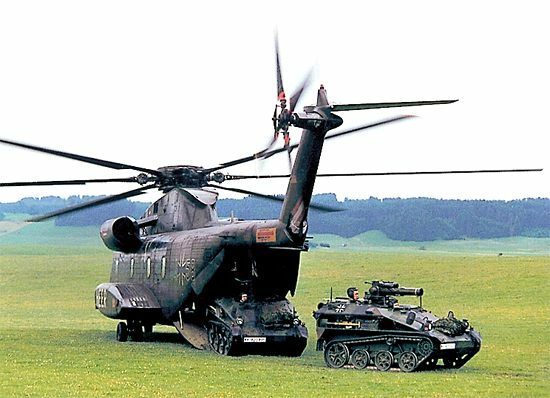 Two Wiesels can be carried inside Germany's old CH-53D helicopters to provide instant heavy firepower in support of landings. Heavy lift helicopters can sling load various armored vehicles, but drag limits the helicopter to a slow and steady 50 knots (one-third speed), making it an easy target in transit and cutting its range in half. It also takes several precious minutes for the crew to unsling and start up the vehicle once it lands, while the helicopter hovers 30 feet above offering an easy target for distant weapons. The US military desperately needs small armored vehicles that can be carried inside Army CH-47Fs and Marine Corps CH-53Es, something like the proposed Rhino. Such a vehicle is ideal to replace most HMMWV weapons platforms, which are common in the US military. 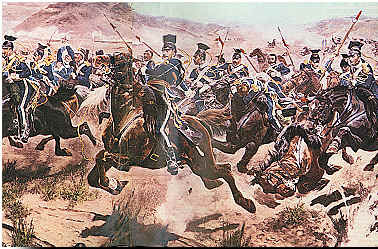 Prevent a "Charge of the Light Brigade"
Updating helicopter assault tactics with these four rules must occur before the US military suffers a "Charge of the Light Brigade" disaster as a dozen helicopters are gunned down in an LZ. The US military lost thousands of cheap helicopters to basic ground fire during the Vietnam conflict, and has lost over 100 in Iraq and Afghanistan. Modern anti-aircraft weapons are more deadly and today's expensive helicopters are not easily replaced. The US military must update tactics before future helicopter assaults end in disaster.